Stanford Yazzie Sandcast Four Directions Cross Bracelet size 6 5/8"
This is a beautifully made sandcast bracelet with a center Four Directions cross contained within three diamonds. Smaller crosses mark the squared out corners of this piece. This is the sort of handmade, traditional jewelry that we seek out and most love. This is a fine design with the large nearly-square plaque in front which transitions to a uniform-width, one-inch cuff on the sides and to the terminals. Hefty and very nice! Hallmarked SY on back. This is solid Sterling silver. 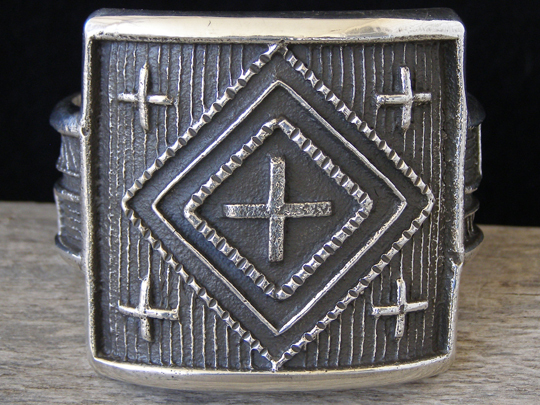 Large center with crosses: 2 3/8" x 2 1/4"
Width of cuff on sides & to terminals: 1"